Stars in a galaxy far, far away formed just 250 million years after the birth of the universe – earlier than any others known, British-led astronomers have found. The galaxy, MACS1149-JD1, is 13.28 billion light years away and contains the most distant detected source of oxygen. Its faint light has taken so long to reach Earth that its journey began just 500 million years after the Big Bang – the cataclysmic event that brought the cosmos into being. Scientists calculated that the galaxy's stars must have formed 250 million years earlier. The presence of oxygen is important because it must have come from an even older generation of stars that have completed their life cycle. Oxygen is only created by nuclear processes within stars, to be released into gas clouds when they die. 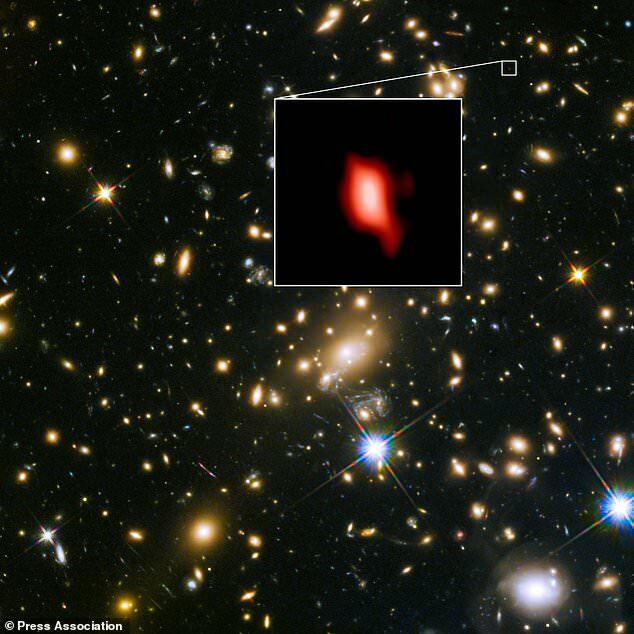 Dr Nicolas Laporte, from University College London, who co-led the team, said: 'This is an exciting discovery as this galaxy is seen at a time when the Universe was only 500 million years old and yet it already has a population of mature stars. The galaxy was studied using the Atacama Large Millimetre/Submillimetre Array (Alma), a powerful radio telescope, and and the European Southern Observatory's Very Large Telescope (VLT). Both facilities are located in Chile's Atacama desert. Mystery surrounds the time the first galaxies emerged from total darkness, an epoch known as the 'cosmic dawn'. Co-author Professor Richard Ellis, also from UCL, said: 'Determining when cosmic dawn occurred is akin to the Holy Grail of cosmology and galaxy formation. 'With MACS1149-JD1, we have managed to probe history beyond the limits of when we can actually detect galaxies with current facilities. 'There is renewed optimism we are getting closer and closer to witnessing directly the birth of starlight. The findings appear in the latest issue of Nature journal.